Wildlife Value: Attracts butterflies, deer resistant. 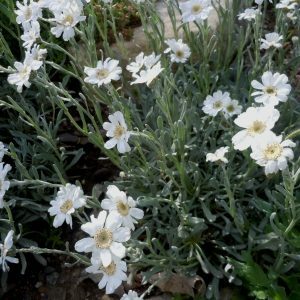 Size: Good in rock garden & troughs. 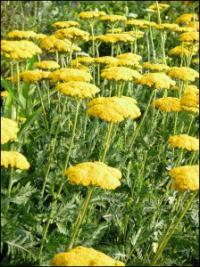 Achillea named for Achilles who used Achillea millefolium to bandage bleeding wounds for his soldiers. According to Philip Miller (1768) Achillea’s common name is “Nosebleed.” Ageratifloia means leaves like an Ageratum. Erect, fern-like clumps of striking silver foliage. Mustard yellow platter flowers in summer. Erect, fern-like, thick clumps of striking silver foliage. Mustard yellow platter flowers in summer. I first saw this plant at the harbor garden in Port Washington about 6 AM one fall morning. The foliage was so arresting it stopped me in my tracks. Collected before 1804. The Balkan yarrow is known to attract butterflies with its Yellow Flowers. Mustardy-gold saucers top 3′ tall erect stems from early through late summer. One of the best dried flowers. 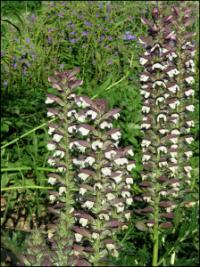 Care: Full sun in well-drained to moist well-drained soil, drought tolerant & deer resistant. Introduced to gardens in 1804 when it was sent from the Caucasus Mountains to Europe. 1800’s in America.